I am having a tough time keeping up with my blog and with all of the swaps that I signed up for! 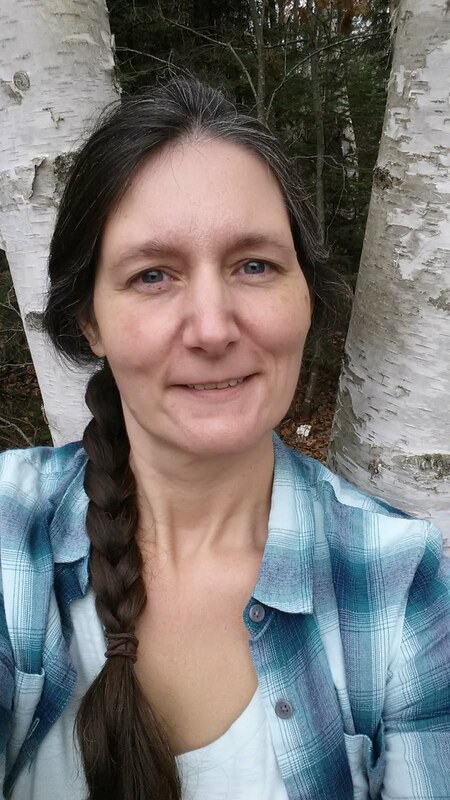 Convention is just 19 short days away and I have signed up for 11 swaps and have a Blog Hop (July 12-14, don't miss it!) to design for, ahhh! I must be crazy! I have come up with 9 of the swap card designs, and cut, stamped, and prepared them, completed 4 of them, and still need to design 2 more. The last 2 are big ones, so I need to make sure I have enough supplies of whatever I design before I start on them. 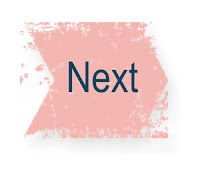 Upside, I will have almost all of my posts for July done way ahead of schedule :) Downside, I feel like I need to do all of my designing for swaps first. 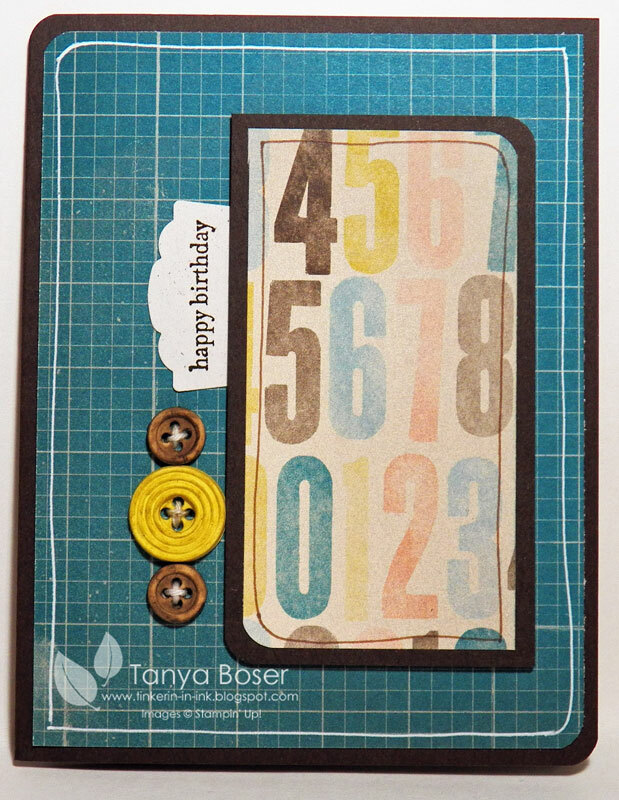 Luckily, this card turned out to be too much fussy cutting for the shoebox swap, which is one of the 2 that I need to design for yet. I do love how it turned out though! Happy last day of June! How the heck did it slip by so fast?! Would you believe the bottom portion is actually sponged with Crumb Cake? It looks so close to the Baked Brown Sugar! 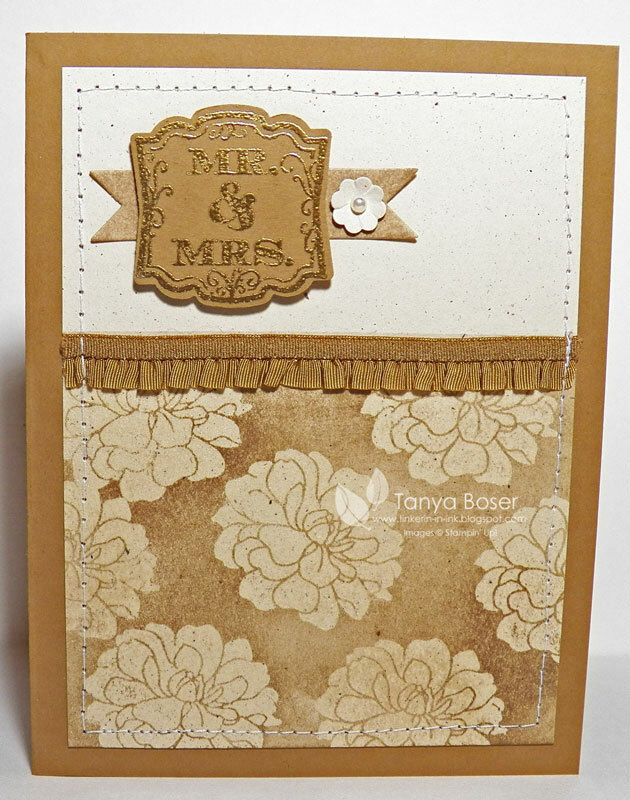 I masked off the top part of the Naturals Ivory panel, then clear embossed the flowers and sponged with the Crumb cake. I was not going to stitch or doodle around the edges, but it looked too simple. I broke down and stitched it down :) The banner is a scrap of Naturals Ivory I sponged with Crumb Cake and die cut with a Bitty Banners die. I lined the inside of the card with more Naturals Ivory and did a little generational stamping with the flower. This card could really be a wedding or an anniversary card, don't you think? Time for a little feminine crafting! I've been so focused on masculine stuff lately, I almost had to remind myself to make something girlie :) And I have bee dying to use this fabulous ruffled ribbon. It is sooo yummy! We all need a card for a sad occasion now and again, and I like to keep a stash of them so I don't have to rush to make one when I need it. But sometimes you need something a little more tailored to fit the person it is going to. Just such a thing occurred recently when one of my uncles passed away on Memorial Day weekend. He was my uncle-in-law for about 30 years as he and my uncle had been together for that long. I will miss Robert aka: Auntie Bo-Bo! He has had AIDS since the late 80's and had been doing very well, until this spring when pneumonia caught him. This card will go to Jerry and they have lived in the California mountains for a long time, so I needed something simple and masculine, serene. I hope that is what I achieved here. 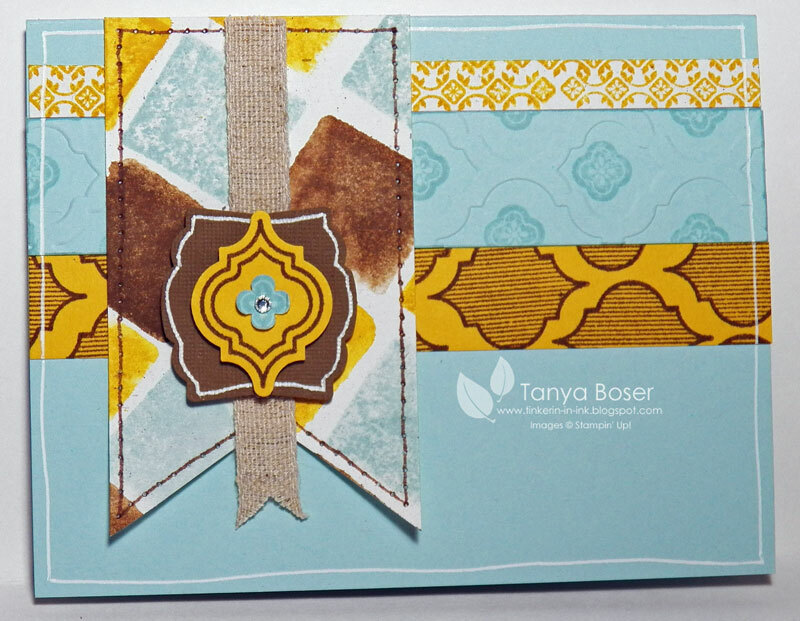 I masked off the top and bottom of the cardfront and sponged on some Island Indigo, Soft Suede, and Whisper White. Then I stamped the trees in Early Espresso and Whisper White, and the sentiment in Early Espresso. After it dried a bit, I added the white gel pen frame. 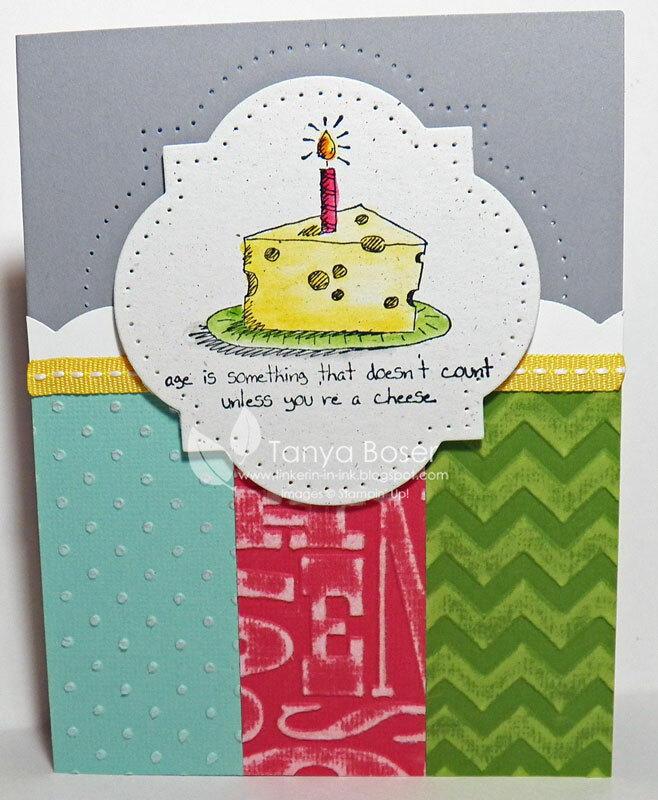 Sometimes you just have to have a funny birthday card and I am so glad that Stampin' Up! came up with this new set! I love the funny stuff! I am not sure who is going to get this card, but I have a few candidates in mind (waggling eyebrows sadistically)! I may have to CAS myself and make this card with a few different images, I love the colors and patterns so much! I am still feeling my way around with this soft and subtle color. 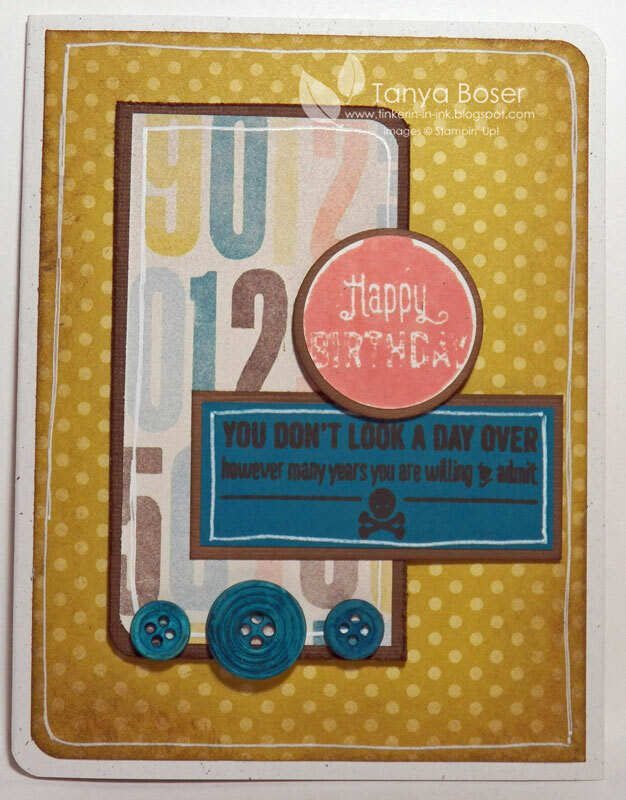 Hopefully I will master it soon :) I have seen some fun cards with a repeating sentiment in different colors and thought I would try my hand at it. This is a rather simple card, maybe a little too simple. I keep looking at it thinking it needs more punch.... I guess we can't love every card we make, can we! When I was doing my projects for the recent SA New Colors Blog Hop, I got a bit carried away! 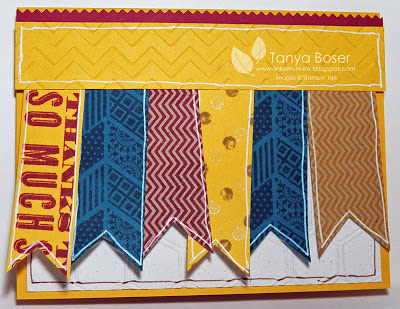 I was having so much fun playing with Crushed Curry, I just couldn't stop :) This started out as a tag, then I stuck it on a cardfront. I better remake the tag, because I think it is just gorgeous! Happy Father's Day to all those wonderful men on our lives! We need to honor those fellas and make them feel special :) I have quite a few of them in my life, and I have already made cards for all of them and featured them on my blog already. So, I decided to make a masculine card that would work for any occasion, so I can send it on a random day to let one of my wonderful men know I am thinking of them. 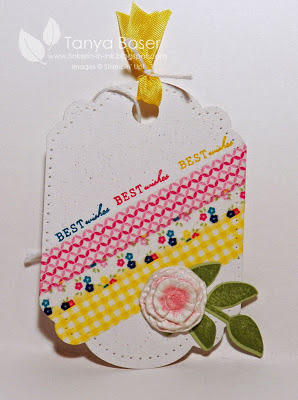 I have been tossing the idea for a watercolored image with this stamp ever since I saw it in the new catalog. It jus makes me think of sunrise at the lake, when all of the "people" noises are gone, and that sun is just tinging the sky with pink.... ah, peace! 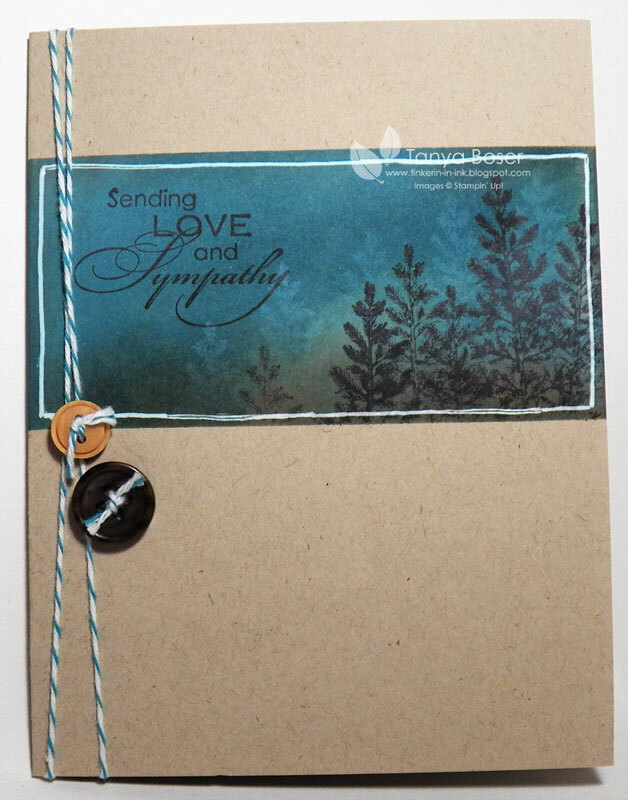 I used the Woodgrain embossing folder as it also reminds me of ripples in the water. 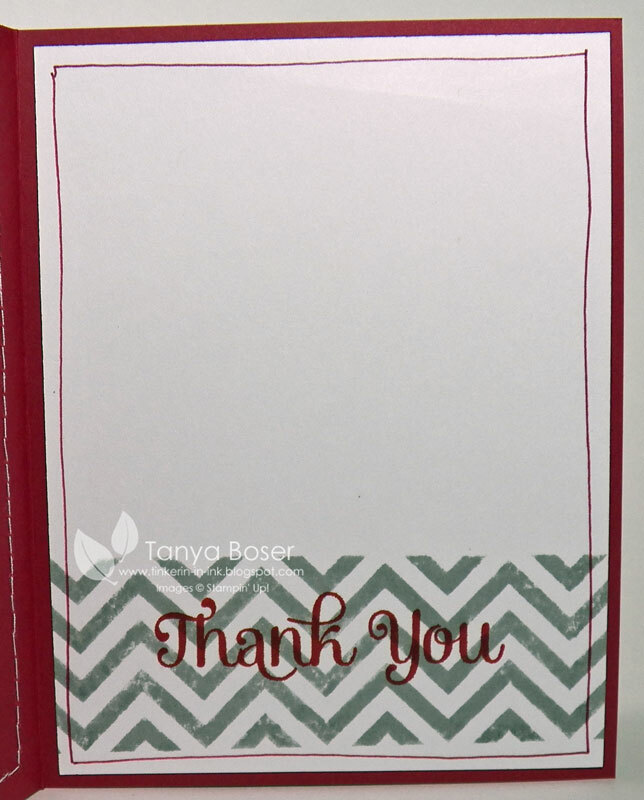 The Chevron ribbon adds to the nautical feel of it :) I must confess, the color scheme was dictated by what color Chevron ribbon I have, hehe! To all the wonderful men in my life, I wish you a dozen of these kinds of mornings this summer! I have been dying to use the new chevrons BG stamp, and this was my first card with it. 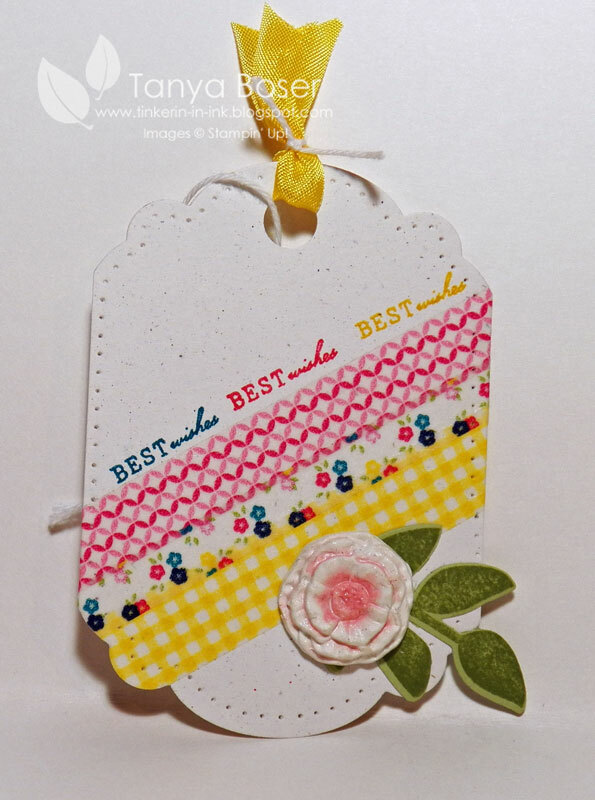 I must confess, this card sat for a couple of days on my desk while I tried to decide what kind of card to make it. I know you can't see it in this picture, but the banner was embossed with a diagonal stripe. The banner just fit in the stripes EF to make it this way! 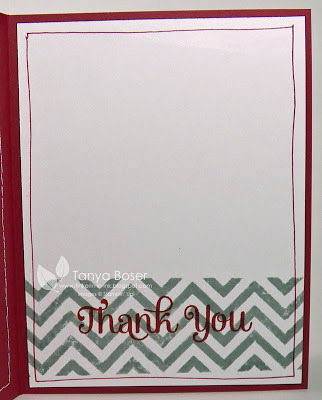 I inked just a portion of the chevrons again and laid the paper on the stamp so that there would still be a strip of white below the chevrons, then stamped the sentiment over the chevrons. I love how this turned out! Something about the Soho Subway paper was calling to me last week. 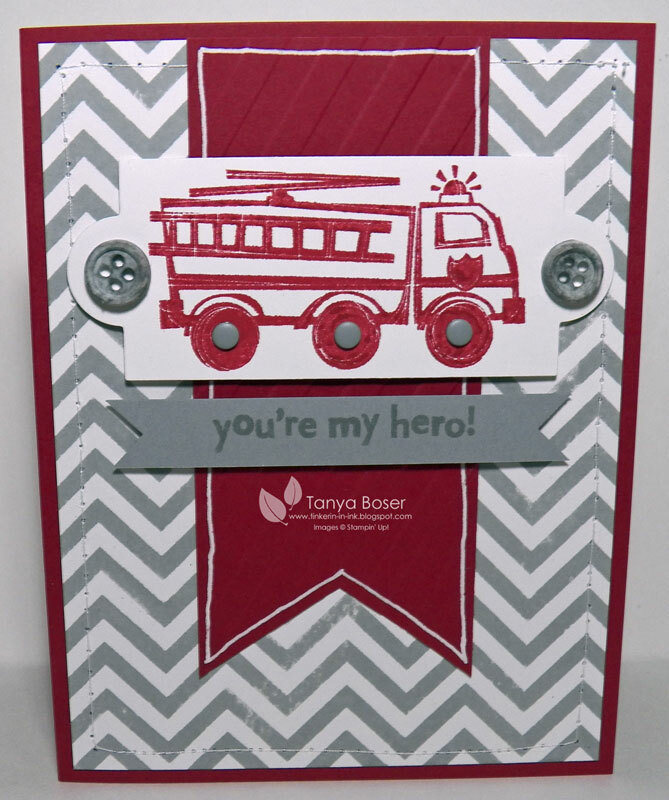 This is one of the cards I made. I just couldn't bring myself to cover up the numbered panel on this card, so there really isn't much stamping. 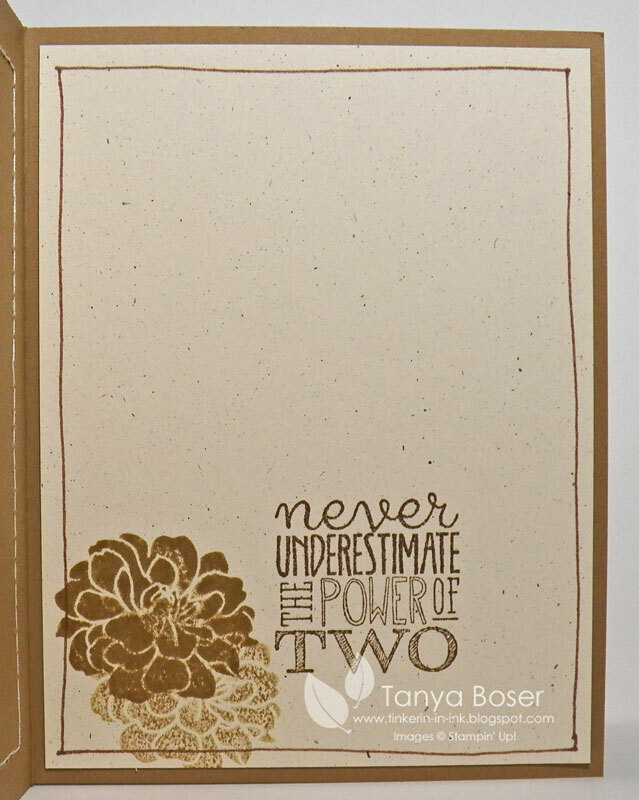 Look how well the Simply Pressed Clay buttons took the colors with a marker! I am going to have to make a bunch more blank buttons, I am already half way through the stash I had made last month. I think I may even buy another set of molds, or 2... so I can mass produce these babies! Welcome to our hop! 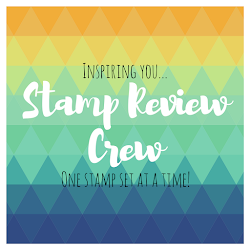 One of the great things about Stampin' Up! is the color coordinated line of products, and the fact that SU keeps it fresh by updating the color families every few years, and adds new In-Colors every year. This year marks another color refresh and SU brought back a few old favorites and introduced some soon-to-be new favorites. 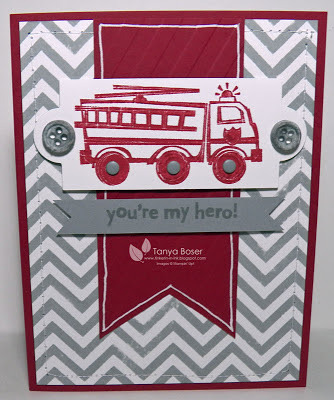 We at Stampin Addicts wanted to highlight these new colors and have put together a fun hop for you today. If you are following along the hop from the beginning, I am stop #9, the last stop! 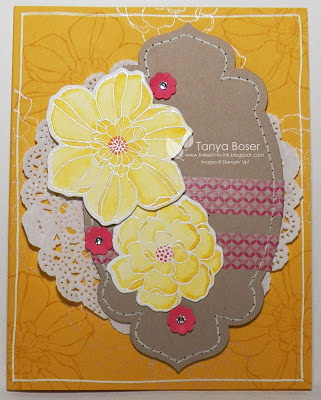 You may have just arrived from Sara's blog where she featured Soft Sky, another of my favorites. Didn't she do a wonderful job?! If you are lost, here is the link to the main hop thread. Don't be afraid to leave us some comments and share conversations there. We all like to chat as much as we like to stamp, lol! I was going for a very masculine feel with this one and you can never go wrong with the banner look. Those chevrons are from the big oval of chevrons from the Oh, Hello set, believe it or not. 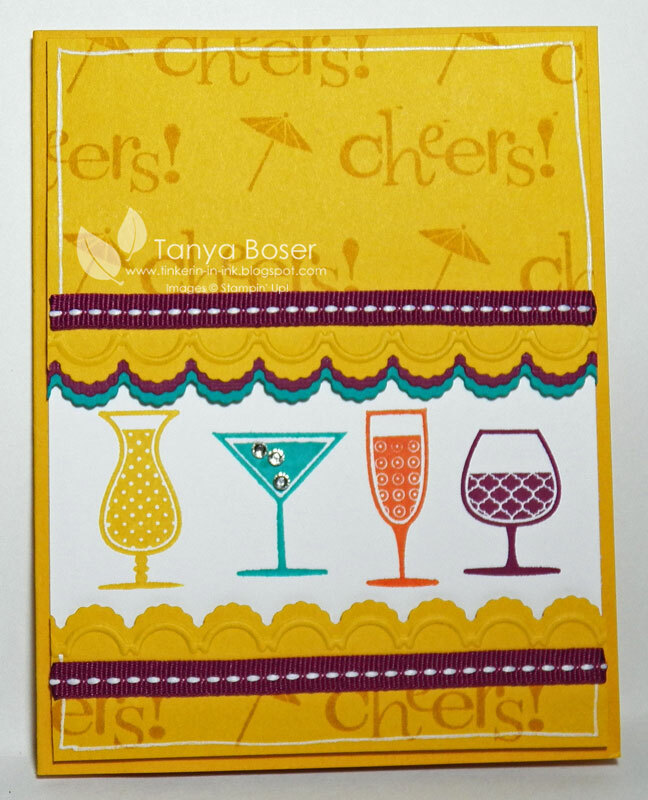 How about a little party in a card! 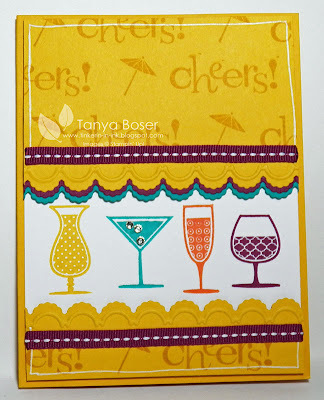 The colors I picked for this card just made me think of fruity drinks at the beach :) I've never drank alcohol at the beach.... maybe I should someday! I was playing with color-blocking again, with the smallest acrylic block and a water mister, and everything seemed to go just fine! I love me some butterflies, and I could not resist making this playful and bright card. Can you see the embossed line frame around the image panel? It is really cute in real life! I hope I have inspired you to go play with you new/old colors! And if you started somewhere in the middle of the hop, your next stop will be Carmen's blog where she shows us the joy of Baked Brown Sugar! Gingham is so fun! Summery. Cheerful. And bright! Who doesn't love gingham? Boring people, that's who! Well, maybe just people who don't like country-style stuff ;) But everyone loves Washi Tape right! I finally used the right technique for the Color Block method! I was not spritzing with water before and it always turned out all streaky, I could never figure out why. I have been a stamper for a long time now, but this old dog still has some new tricks to learn, I tell you! 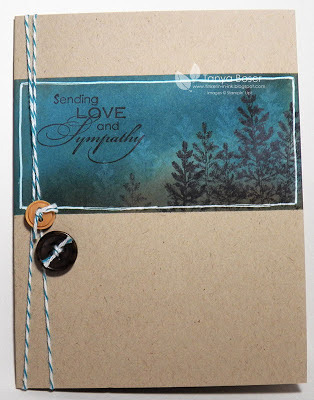 This card fits right in with the Midweek Throwdown at Operation Write Home, challenging us to make cards featuring water! 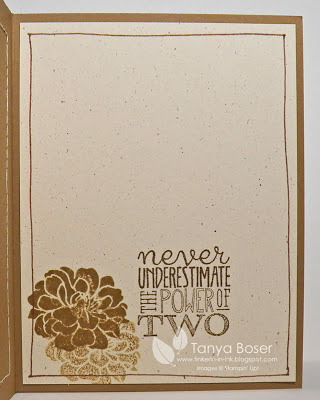 I was just playing around with this technique, then decided I needed to make my practice stamping into a card. 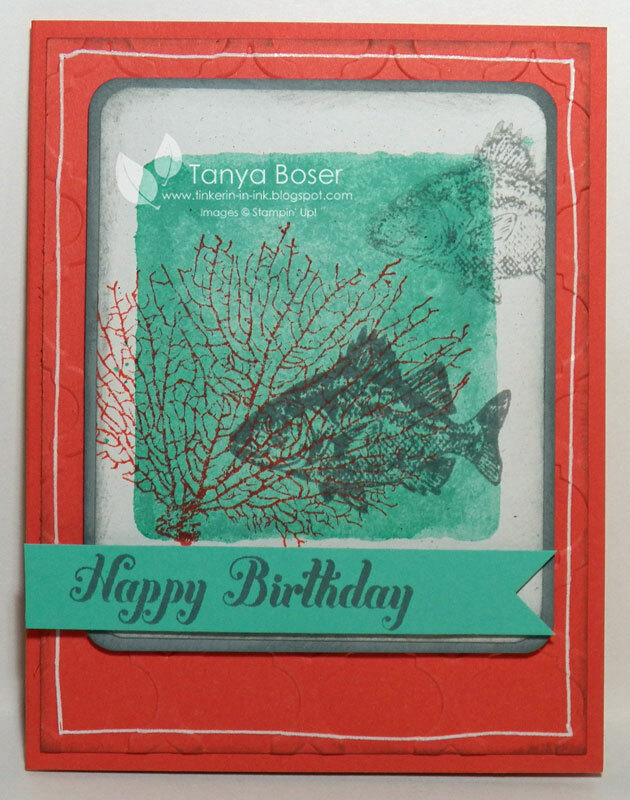 A little texture and some sponging give this card more depth. I feel like this card could be for a woman or a man, the colors are just gender-neutral enough to pull it off. Don't forget to come back on Monday, June 10, 2013 for the New Colors Blog Hop! While we all wait for our New Catalog goodies to arrive, how about a little love for the Photopolymer stamp set that came out last month. I have hardly played with it! It has some great humorous birthday zingers and I can think of a few people I could give this one too. The buttons are made with the Simply Pressed Clay and Mold. I made a bunch of plain ones when I first got my preorder so I could color them any color I wanted. I found the best way to color them is directly with a marker. Quick and easy, but I do get my fingers all inky, lol. Another lovely thing about the Simply Pressed Clay is that the finished embellishment sticks to your project easily and firmly with your Tombow Mono glue! 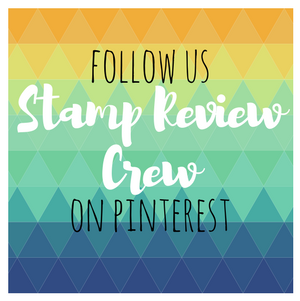 And heads up, there is a quick blog hop coming on June 10th featuring the new colors of Stampin' Up! so don't forget to stop by! Jamie and I have been married for 23 years today! That puts a big smile on my face. I love that man of mine, and really feel he is the catch of my lifetime. You might actually get to see his card before he does since this is posting before he wakes up, lol! 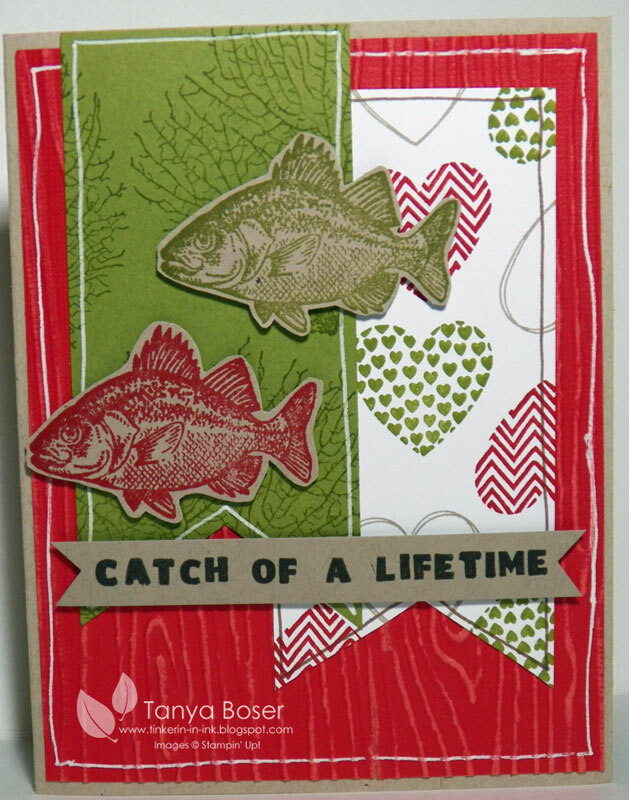 My man does love to fish, so this is so appropriate :) One of the good things about having a blog that I share most everything I make is that I can go back and see what I made for people in years past so I don't repeat myself. I was reviewing the last few years' cards and noted that I have not done anything relating to outdoors stuff yet, and this popped into my head. Nothing new on this card, but I don't have anything but the Mosaic Madness and Label Love sets yet from the new catty, and they just did not seem to fit the need for this card. Sometimes I find it harder to make a card for a really special person because I feel like it will never express what I am feeling well enough. Anybody else feel that way?